After the previous evening's psych extravaganza, our weekend in the Northwest continues and I realise that staying up drinking until 3am might not have been the wisest of moves. I discover that we need to leave our hotel (seemingly staffed entirely by robots) by 10am and there are a few local attractions to take in before heading over to Liverpool for the day's main event. 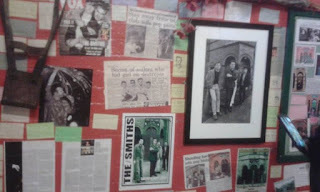 If you'll allow me a digression from the primary topic of this review, I must say a few words about the iconic Salford Lads' Club. 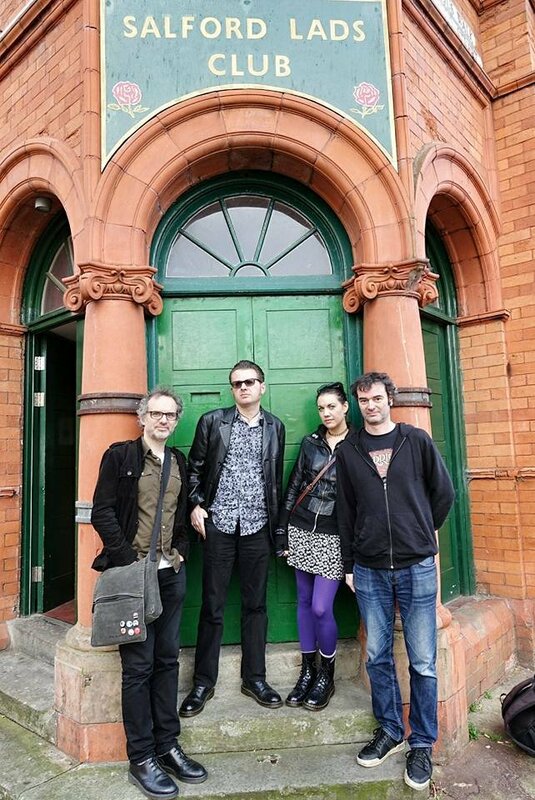 With an hour or two to kill, we decide to take a brief detour with the aim of simply seeing the outside of the building and recreating the classic promo photo from "The Queen Is Dead" - something that has probably been done by every music fan visiting Greater Manchester. 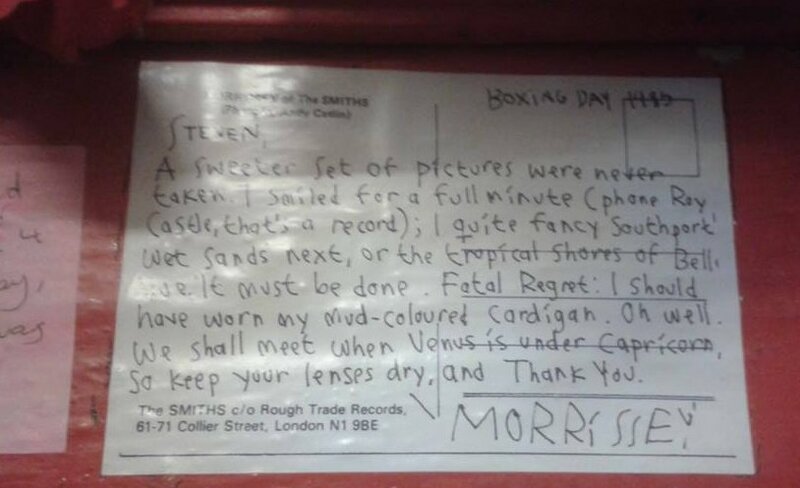 I wasn't expecting the building to be open on a Sunday morning, I wasn't expecting to see an impressive array of Smiths memorabilia and above all, I wasn't expecting to be given a tour and detailed history of the club from a gentleman whose knowledge and enthusiasm was startling. If you're in the area then a visit is essential. Having said goodbye to the rest of our group, we finally reach Liverpool with a bit of time to see robots and William Blake at the Tate before taking in a beautiful sunset over the Mersey. 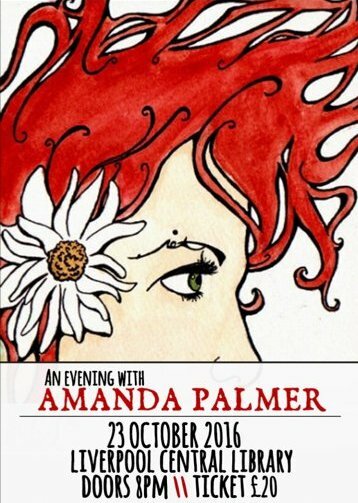 On a whim, we tweet Amanda Palmer to ask if she wants to meet for a drink before the gig, but sadly she doesn't respond. It's been said that I'm rather obsessed with Amanda and I don't suppose there's any point in me denying that. She was one of the first artists I wrote about when I started this blog and my love for her has in no way diminished in the intervening years. But she inspires this passion in all who meet her, fans of Amanda do not do anything in half measures. These great photos from Andrew AB Photography show how Amanda is happy to spend time with each of us after her set, comforting those who need it. The emotion on some of those faces is striking. 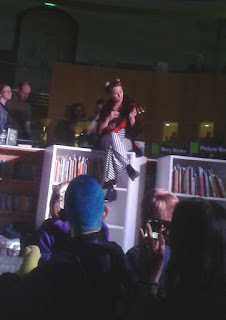 When this intimate event, part of the Get It Loud In Libraries scheme, was announced, it sold out immediately and I still can't believe I managed to score two tickets. We arrive shortly before the show begins and find that most of the audience are already seated on the floor so I'm doubtful of finding a spot with a clear view. However, despite the show being in such demand the library seem to have put a limit on numbers so we can all spread out comfortably. We choose the best spot available although it's not that close to the stage. But it turns out we couldn't have chosen better as completely unannounced, Amanda strolls through the room and walks right past us before being helped onto a bookcase right in front of us. She begins to strum her ukulele and opens the show with "In My Mind". If I had to compile a "Top 5 AFP songs that move me to tears" then this would definitely be in there and as I'm already quite emotional from lack of sleep and the day's hectic activities, I wonder if I'll be able to keep it together throughout the set. 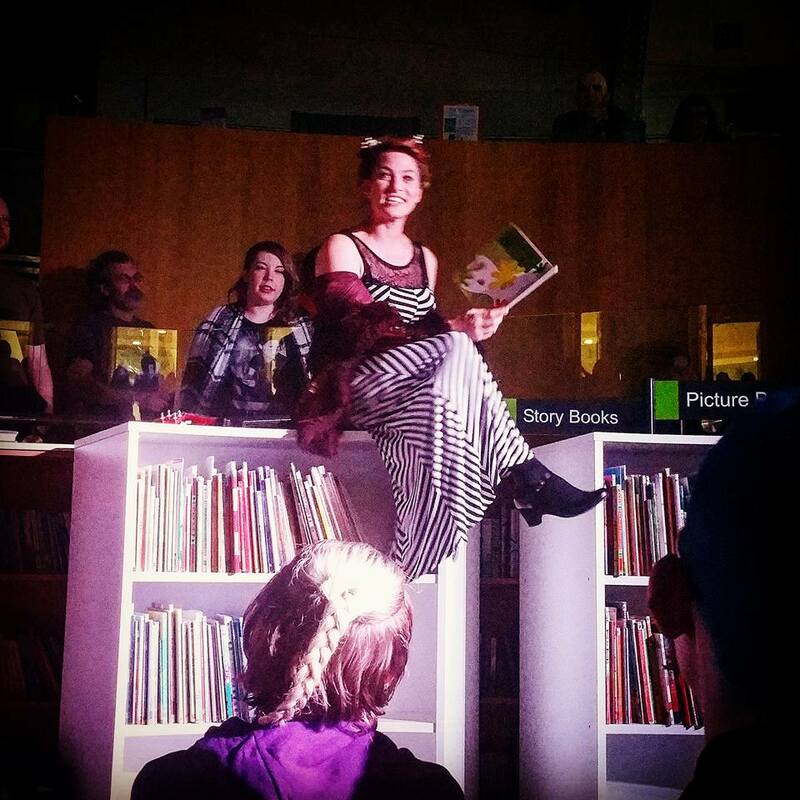 Still perched atop the bookcase, Amanda asks an audience member to pick out a children's book. It feels like we're back at school as we sit cross-legged on the floor while she reads us a story about vegetables, although I have a suspicion that the expletives she uses are not in the original text. Once the story is over, she moves to the piano at the front of the room but everyone remains seated on the floor so we still have a perfect view. In a recent email, Amanda asked fans to suggest songs for this tour so she can rehearse them beforehand - "sharpen the songs and have them in the quiver", as she puts it. Once in front of the piano she confesses that she's not had time to add as many songs to the quiver as she would have liked. Nevertheless she is happy to build a set spontaneously and the classroom atmosphere is maintained as we're asked to raise our hands if we have requests. She launches straight into the first request, "Astronaut", without delay although she does seem slightly hesitant about some of the songs that we suggest. She can't remember which key one song should be played in and when a fan offers the answer, she light-heartedly calls them a nerd. We're treated to "Trout Heart Replica", "Delilah", "The Jeep Song" and also more upbeat moments in the form of "Leeds United" and "Coin-Operated Boy". Amanda is known for her cover versions and is often criticised for not showing due respect to the original artists. Many claimed that her tributes to Bowie and Prince, for example, came too soon after the artists' deaths. But as we're in Liverpool, no one is going to begrudge her a Beatles number. As we're in a library, it seems fitting to choose one with a literary theme. Although everyone who has ever picked up a musical instrument must at some point have played a Beatles tune, "Paperback Writer" is not one that I've often heard covered. It's amazing how the manner in which a song is played can totally alter its meaning. The original, with its distinctive guitar riff, has always struck me as a cheery song with McCartney talking optimistically about his creative aspirations. But with the guitar replaced by piano, it becomes poignant, as if a would-be writer is lamenting their lack of inspiration. It strikes me that this is how I feel in the presence of one such as Amanda, but also that my musician friends must tire of me saying how I envy their skills. I'm constantly told to stop undermining my own abilities, to stop making excuses for not pursuing my writing. This new interpretation of "Paperback Writer" makes me determined to get several articles written this week. The show seems to fly by and I lose track of exactly long we have been sitting captivated; I would estimate that it's the best part of two hours. The beauty of Amanda's lyrics is that she is open about her own failings and makes it clear she is just like each of us. Each audience member will have their own favourite moments of the night, their personal reasons for relating to specific songs. But we are suddenly drawn together by the bare-bones sorrow of "Bigger On The Inside", delivered with just ukulele and no amplification. After just two lines, I can no longer hold it in and I gently rest my head on my companion's shoulder, letting the tears flow. By now everyone in the room is in the same state, and Amanda herself needs to be handed a tissue at the end. This is one of her most personal songs, with its reference to friends dying of cancer, so it's clear why she struggles to get through it. On the long journey home I ponder why I've been moved by it more than usual on this occasion. 2016 has not been a good year for personal and collective loss, but being in Liverpool has also reminded me of my own musical upbringing. Many of you will know that my interest in music was triggered by my dad playing me his copy of "Sgt. Pepper", and I'm sure he would have loved to visit here and the Beatles museum in particular. I'm sure he would also have enjoyed Amanda's music, as honest songwriting was very important to his musical tastes. As I finally climb into bed at 2am on Sunday night/Monday morning, I'm grateful for such a diverse weekend. I make a note that we should return to Liverpool soon to take the full Beatles tour, and I also vow to do my dad and Amanda proud by taking my writing more seriously. Let's hope that I can keep at least one, if not both of those promises.